I’ve really missed graphic adventure games. 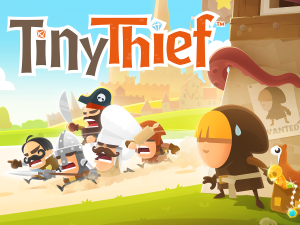 In a nutshell, Tiny Thief by 5ants is a story of a young thief who robinhoods his way through the kingdom, steals the heart of a princess, and goes to rescue her from evil knights. To play you point and tap your way through puzzles. If you really need them there are even hints, but beating the level is usually straight forward enough. Something has to be said for the art which is adorable and makes this a real storybook adventure. Time and and attention to detail obviously went into the graphics and animation. The music could have used a little more attention considering, it feels a little repetitive. Otherwise, this is a flawless little adventure I really enjoyed. You can play it mobile from either Google Play, or iTunes. Remember to be nice to the monkeys. * Here in the west anyway, apparently adventure games still make up a big chunk of PC games in Japan. UPDATE – Price on Tiny Thief now a super steal, just dropped to a dollar.